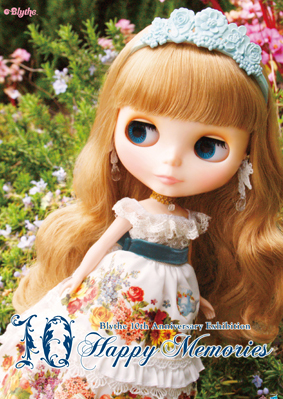 Dolls with ATTITUDE: HAPPY 10th ANNIVERSARY NEO BLYTHE!! 10th Anniversary Neo Blythe "Ten Happy Memories"
Yes, today, the 23rd of June, Neo Blythe is 10 years old! It seems like yesterday the day I spotted the SONY Minidisc ads with a Blythe, photographed by Gina Garan, and said I wanted a doll like that! I almost bought one in 2002 in Japan, but gave up due to lack of luggage space (what have I done!). Seven years had to pass until I could afford one again, and now I'm close to addicted. But the most fun in these 3 years since there's a Blythe doll with me, has been making clothes ant taking pictures of them. FELIZ 10º ANIVERSÁRIO NEO BLYTHE!! Neo Blythe do 10º Aniversário "Ten Happy Memories"
Sim, hoje, dia 23 de Junho, a Neo Blythe faz 10 anos! Parece que foi ontem que vi os anúncios da SONY Minidisc com uma Blythe, fotografada pela Gina Garan, e disse que queria uma boneca daquelas! Quase comprei uma em 2002 no Japão, mas desisti por causa do pouco espaço de bagagem (o que foi que eu fiz!). Tiveram de passar sete anos até eu poder novamente comprar uma, e agora estou quase viciada. Mas o mais divertido nestes 3 anos desde que há uma Blythe comigo, tem sido fazer-lhes roupas e tirar-lhes fotografias.